Our valley has slightly less snow than not, yet we have already been out harvesting a few important edibles. 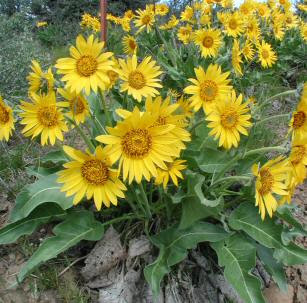 The first being Arrow Leaf Balsam Root. Climbing over patches of snow to reach the bare earth we looked for the sentinels of last year's growth. If you've never seen this beautiful member of the asteraceae family, then here's a great photo on your left. Like I said, things are just popping their heads up, so we were looking for something more like this. It doesn't look apetzing here, but this plant holds many culinary delights. The first thing we were after were the new shoots. You have to look really closely to find them. You can eat this shoots raw, they were about an inch long when we harvested them and had a crisp resinousy taste. I really enjoyed them. We harvested several from different plants and took some home to stir fry up with some onions. I preferred them raw, they got kind of lost in the onions. Here's some in a bowl awaiting the cast iron skillet. We also harvested the roots using a kupenz, or digging stick. To harvest it for food you want only pencil sized roots. After digging it up you can pound the root with a stick to dislodge the hard outer shell. Then you cook it for at least 12 hours - we did ours in a crock pot. Once it's done it has a sweet nutty taste and is eaten like tough asparagus. 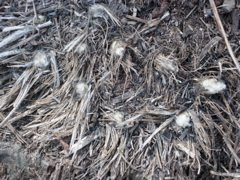 The roots are highly medicinal and are a bio-regional substitute for echinacea. 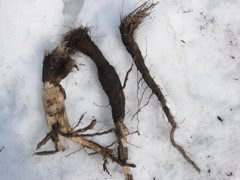 When harvested in the fall the roots have more immune-stimulating and anti-microbial properties, while those in the spring have more of an expectorant quality. 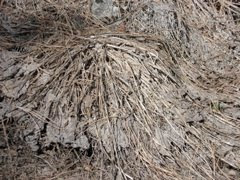 (Michael Moore, Medicinal Plants of the Pacific West) Although other herbalists claim that the immune stimulating properties are in the spring root, while the anti-microbial properties are in the fall root. 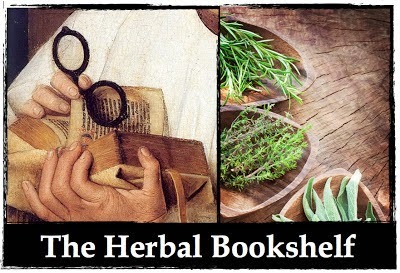 (Gregory Tilford, From Earth to Herbalist) In any case, you can take the tinctures from both the spring and fall and combine them to create an anti-microbial, immune stimulating expectorant. Since I recently moved this an area that boasts this beautiful plant this will be my first introduction and I am looking forward to getting to know it better. 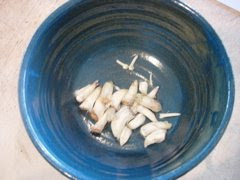 I know you can also eat the seeds and the leaves can be used as poultices. Does anyone else have arrow leaf growing near them? Has anyone tinctured the root before? Eaten it as food? I would love to hear other people's experience.